In some cases you may be needing to add new models to your application in order to cover unique business needs. The process of extending Sylius with new entities is simple and intuitive. As an example we will take a Supplier entity, which may be really useful for shop maintenance. A Supplier needs three essential fields: name, description and enabled flag. 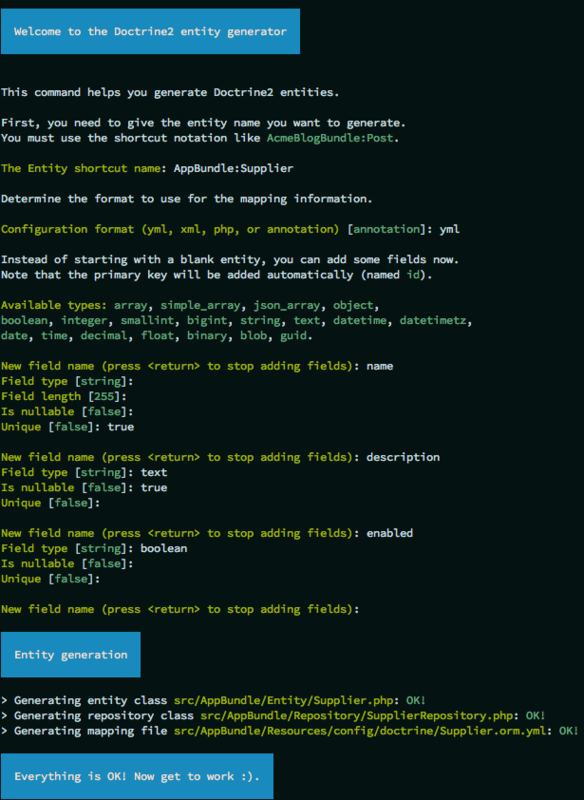 Symfony, the framework Sylius uses, provides the SensioGeneratorBundle, that simplifies the process of adding a model, or the SymfonyMakerBundle for Symfony 4. Remember to have the SensioGeneratorBundle (or SymfonyMakerBundle depending on your Symfony version) imported in the AppKernel, as it is not there by default. You need to use such a command in your project directory. The generator will ask you for the entity name and fields. See how it should look like to match our assumptions. If you don’t have it yet create a file app/config/resources.yml, import it in the app/config/config.yml. See how to work with API in the separate cookbook here. Using API is not mandatory. It is just a nice moment for you to try it out. If you are not interested go to the next point of this cookbook. To have templates for your Entity administration out of the box you can use Grids. Here you can see how to configure a grid for the Supplier entity. Create the app/config/routing/admin/supplier.yml file. Include it in the app/config/routing/admin.yml, which should be also included in the config/routes.yaml. See how to add links to your new entity administration in the administration menu. To see what you can do with your new entity access the http://localhost:8000/admin/suppliers/ url.